It's a fact, without a quality preschool education, children from lower income neighborhoods often fall behind in their cognitive, social-emotional, math and language skills. These effects can last a lifetime. Tot's Haven Christian Academy provides the nurturing learning enviroment and proven teaching techniques to close this gap and help your child embrace a lifetime love of learning and a foundation for success. Bridge the gap to success by challenging the hearts and minds of children by providing a warm safe haven, quality instruction and mentoring for their spiritual, intellectual and physical being. Tot's Haven Chrisitan Academy offers a loving, caring, faith-based environment that instills the positive values of honesty, loyalty and self-worth. We foster an open relationship bewteen the parents and staff and encourage parent involvment in their child's education. We know that children learn best in a creative, nurturing environment and we strive to provide a place where each child can achieve their very best. Tots Haven offers a quality learning environment at very affordable prices. And we accept child care subsidies like CCMS to ensure your child has access to quality care. 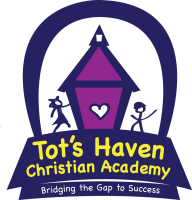 Help your child succeed with a firm foundation from Tot's Haven Christian Academy. We know that your child is your most precious gift. We feel the same, and provide a safe and nurturing environment where your child can blossom socially, emotionally, spiritually and academically. We know you're busy, so we provide safe, reliable transportation. You can be sure your children are in good hands until you pick them up in the evening. Call for more details about the transportation we offer. Our teachers offer children a fun, structured learning environment filled with developmentally age-appropriate activities. Early literacy, music and movement, quiet story time and more help your child reach important developmental milestones for success in school.